Every week me and many others participate in 52 Snapshots of Life photo challenge hosted by The Lazy Pit Bull. You don’t need a blog to participate; you just need to use the hashtag #TLPB or #52Snapshots on any social media. (TLPB's Christina is having a pre-Blogpaws sale on media kits. If you need one, you can get in touch with her through her blog.) This week’s theme was an easy one for me as I’m often found UTB or Below the bed. Gramps used to joke that “you meet the most inneresting people under the table.” I understand he liked to pawty and frequently did wind up under the table. MOL! While I can be found sitting on a chair below the table, my office is UTB. In these pics, I’m not really hiding cos when I get scared, I burrow into TW’s mattress. In these pics, I’ve just bitten TW and she’s cussing me out. You can see how defiant I still look. Has she finished her tandum yet? 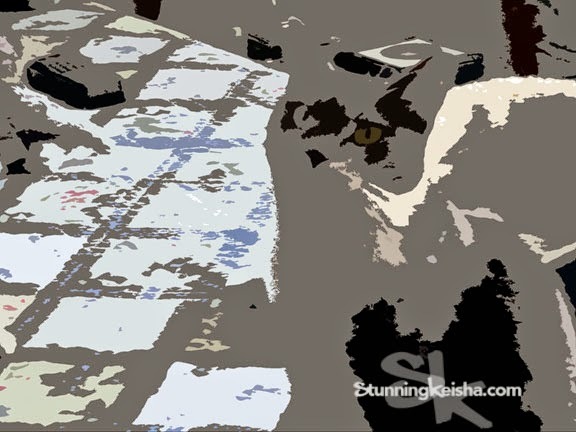 To cap off the week, I also participate in the Caturday Art Blog Hop hosted by Athena and Marie. I love to see the other entries and you can too by clicking the link. For the art entry, I’m on top of the bed. I made this in 2010 and it’s prolly posterized cos TW didn’t write anything down. I like the colors. I also like my raccoon mask. Yes, I know it makes me even more stunning. Have a fun weekend! I bet you’ll be picking out your Cinco de Mayo outfit. Unfortunately, Grooveshark went belly-up and took all my playlists with it so I ain’t got my award winning Cinco de Mayo set. Hope you're feeling better, CK! I've got an office under the bed TOO! I really need to get a treat cabinet installed under there. I have an office UTB too. I like to go under there and MEOW loud. We love those looks you're givin TW! Our Mommy calls our little office UTB a "Den of Iniquity". You're allowed under the bed, CK? If any of us go there, we risk getting hauled off to the vet! I get under the bed mostly for privacy. I hope you are doing better today CK! Dang... we don't have a fancy UTB office like that, the office space in our house has drawers, making it impossible to go UTB... Purrs from the Zee and Zoey Gang! Lovely art and pic! Can't get under the bed in our house as it has drawers under it. That's OK, as only the very best kitties reside under the bed! I can be found there when things get noisy! I find discretion is the better part of .... errrr ... something!!! I can't get under the bed either because of stoopy drawers. If I want to keep out of the way, I burrow under the duvet. I love the Art- you look like an angel, I see wings and a halo. TW swears at you for biting her-poor kitty. What is it with you Jersey kitties? I adopted KaTwo from NJ and she bites me and scratches too. It took me a long time to find your little face in your art photo but now when I look at it it jumps right out at me! When I get scared, I find the highest place in the house. Under the bed is a great hiding spot. Cinco likes to hide under my bed. He also likes to hide under the couch. I always know where he is though because he falls asleep and he's a pretty loud snorer. You have a great defiant look! Great shots!!! Mes LOVES the under and over the bed! Mes LOVES your art too. And OMG! Cinco De Mayo is on Finish the Sentence Tuesday! We sure don't want to be on your bad side, CK! Lita bites the humans, but it is more like a warning chomp - it is never hard. And come to think of it, it's almost always Mom's friend, D, that she bites because he keeps pettering her even when she's flipping her tail angrily at him, MOL. Weez been purrayin' hawd fur ya' CK and hope yous duin' better. As fur yous ofice, dat's purretty cool. Guess me wuld have to say ifin me had a office it wuuld be da top of da cat twee. MOL Lexi sez hers is unnew da covers. MOL Me needs to figger out what a media kit is and decide ifin we need one, but fanks fur da info. Hope yous have a pawsum day. I was furry happy to hear you was doing better, CK. I do not like to think of you feeling poorly, darling! That artsy one took me awhile to figure out! An office under the bed is great... our kitties like to have 'mothers meetings' under the bed.